I was recently asked about my thoughts on what was required to pass the 6th and 7th dan grading examinations. Over the years I have heard various theories. One of my favourites was from a successful Japanese candidate for 6th dan, who explained that throughout your tachiai you should have the feeling that you are writing the hiragana character “no” の with a writing brush held between your buttocks. 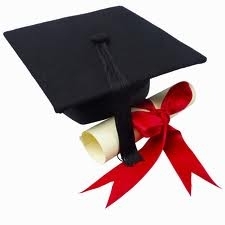 Like many of the guidelines for passing grading examinations, the meaning becomes clear once you have reached the required level, but appears as if it is designed to confuse those preparing for the next stage. To the best of my understanding, “Jiri “ or “Jiri itchi” means the unity of technique and theory, so you not only need to deploy successful techniques, but you also need to look like you know why you are deploying them. To put it another way, you should do nothing that has no purpose. Techniques should correspond with real opportunities to strike, but whereas with 4th and 5th dan the focus is on breaking through the centre with seme, you now need to add the more subtle principle of “hikidasu”, or pulling your opponent in, so that you can respond with debana waza or ojiwaza. Many people are given over simplistic advice, such as “wait 30 seconds, give a loud kiai and make two good attacks”. This sounds ideal, but it is perhaps too simple a way of saying that as you stand from sonkyo you must make strong mind contact with your opponent and then strive to make opportunities to attack. If you can only make one strike in the brief time available, so be it. On the other hand, if you make or are given 20 clear opportunities to strike you must take advantage of them. The rule is don’t attack when there is no opportunity, but do when there is. This should be overlaid on all the things you had to get right for the previous gradings – correct footwork, posture, kamae, tenouchi etc. and of course don’t drop the writing brush. A number of grading exams are looming in the UK and many people whom I practice with are starting to think about what they should do to pass them. We had a mock grading exam in my local dojo and quite a few conversations about the best way to present oneself on the day, but I am not convinced that this will have provided the answer. Now, I have not seen statistical evidence to back this up, but I believe that kendo has more than its fair share of practitioners with masters’ degrees and PhDs. I would not be taking too wild a guess in assuming that these individuals have had considerable successful experience in studying for and passing examinations, yet almost universally, kendoka assume that all they need do to take a grading is to turn up on the day and show their stuff. Clearly this works for many, but to quote a business cliché “if you fail to prepare, you prepare to fail”. 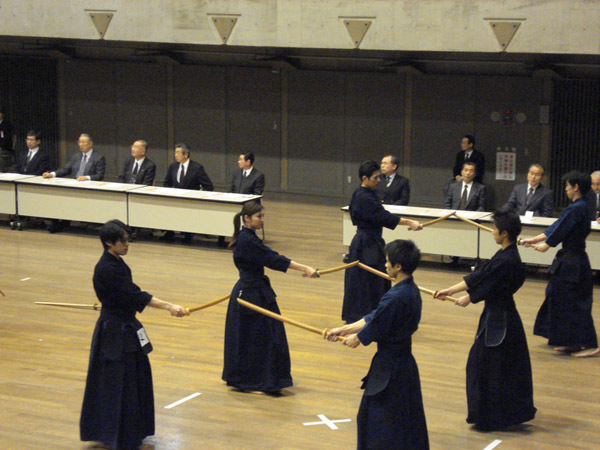 Nearly all kendo associations have a syllabus of what is expected for each grade, hidden somewhere in their web-pages. I will leave it to those interested parties to do the research, but the core is that you need to be able to do correct kendo basics with ki-ken-tai-ichi and then progress through renzoku waza, correct timing and opportunity and seme incrementally as you move up through the grades. Surely there is some sense in understanding what is required for your next step and practising it for long enough for it to sink in before each grading. 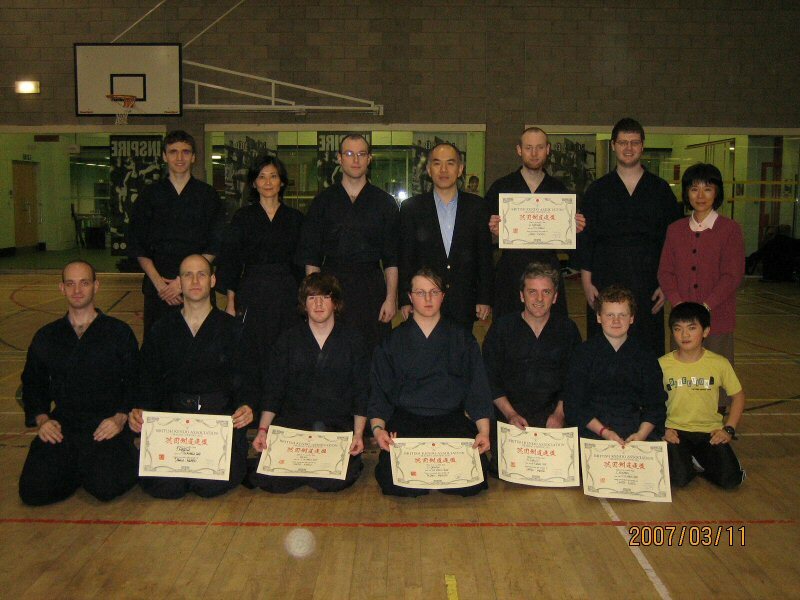 Many kendo clubs and renmei provide pre-grading seminars a few days before, or on the same day as the grading. Whilst these are great reminders of what you should do, they are not designed to help you make major changes or fix fatal flaws. You need to practice something intensively for at least three months for it to become part of muscle memory. Many sensei say that your keiko should be the same as your shiai and that should be the same as your grading performance. This does not mean that you should slug away in your keiko whilst doing your best not to get hit and then replicate that in an examination. Nor should you briefly switch from your “yippee this is fun” keiko to something approximating serious kendo on the day of the grading. 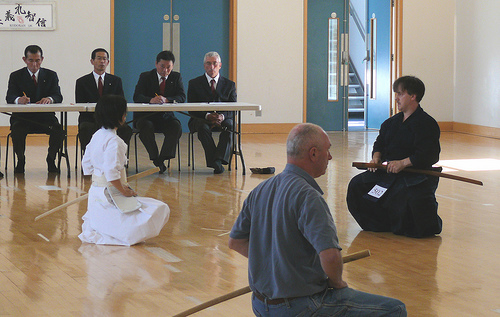 Rather it means that you should treat every kendo practise as if you were being judged on it. Good luck and start preparing. This week I received a request to outline the qualities required to pass the grading examinations up to 5th dan. I recentlyposted on the both the 4th and 5th dan examinations and on the difference between ikkyu and shodan, so I will not go back over the same ground; instead I will talk in more detail about 2nd and 3rd dan requirements. I have in front of me the ZNKR instructions to examiners from 1998. These may have been since updated or replaced, but these definitions may give you some idea about how much reliance is put on the judgment of individual examiners. Not a lot to go on really. The only difference is the introduction of the word “applications” which gives the clue that examiners are looking for the “why” as well as the “how”. From my own perspective, I believe that there is a clear difference between the two grades. As with sho-dan, nidan requires good basics incorporating ki-ken-tai-ichi. At this level shikake waza is important. You should be able to move correctly and strike men, dou and kote with full spirit and commitment. Your cutting action should be relaxed and correct with the point of the shinai going forward rather than back towards your own nose. In addition it helps if you are able to demonstrate one or two ni-dan waza to show that you have the balance, control and acceleration to make successive attacks. At this stage seme and tame are not specifically required, but you need to show an appreciation of opportunity and timing so that you can make clear clean attacks rather than sink into a succession of pointless ai-uchi. For third dan the picture starts to change, as per the subtle suggestion of the ZNKR. We are now looking for all that ni-dan had to offer but with a stronger understanding of timing and opportunity, including the use of oji-waza. As well as the ability to hit your opponent at an opportune moment, you need to create some opportunities to attack. This is where you sow the seeds of seme. Whilst a long way from the strong seme required for 4th and 5th dan or the push / pull ability of the kodansha ranks, you need to create some opportunity by either pushing through the centre or tempting him or her to come forward into your distance. In both cases there is no need to rush or panic, but better to find one or two clear opportunities to attack; and whatever you do, do not cower or attempt to block your opponent’s strikes. We are judging you on what you can do, not what he can’t. From the comments to my last post, it is obvious that grading examinations can be controversial. As a regular grading panelist and having been on the other side of the judges table numerous times both in Europe and Japan, I feel it is worth sharing my thoughts on how I perceive the process. I can of course only speak for myself, but as part of my own development I have asked a number of senior sensei for their guidance in this area. Firstly and most importantly, I believe that we look for good points rather than the bad. We would rather see candidates pass than fail. We need evidence that a candidate can perform to the required standard for the grade and if this cannot be produced in the time allowed, then they will unfortunately fail. I have often felt palpable relief amongst the judges when someone has managed to make a good technique within the closing seconds of the grading. Serious mistakes however tend to rule people out at an early stage. Not necessarily because these errors are critical in their own right, but because they demonstrate an inability to do what you need to do. For instance, if your left heel is on the floor in chudan kamae, you show that you are not able to move forward instantly when you see an opening. If you step back from sonkyo you show a lack of pressure and seme. If your posture is incorrect then you won’t be able to hit with ki-ken-tai-ichi, and the list goes on. There is a level of subjectivity. There are written guidelines for panelists, but at the end of the criteria for each grade is a caveat which translates along the lines of “must demonstrate that he or she has reached the standard of — dan”. However in kendo, we are as a rule, two dan grades above the level we are judging. You also have five or six individual judges, with their own, un-discussed opinions. This is in my view, much fairer than the system in some martial arts; where one solitary shihan can dispense grades at will. 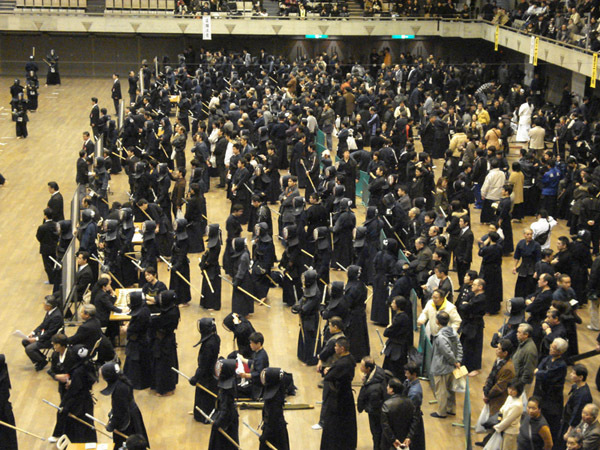 Kendo also strives to eliminate bias by making the process anonymous, which is why zekken are removed and in Japan, overly large names on hakama are taped over. In the case of the kodansha gradings in Tokyo or Kyoto with 1000+ candidates and eight to ten panels, applicants and judges rarely know each other. For gradings in Europe there is a real chance that the panel will recognise many of the candidates. In my experience we try to divorce the person from the kendo displayed on the day. The system is of course not perfect, but I believe that it is as robust as it can be.